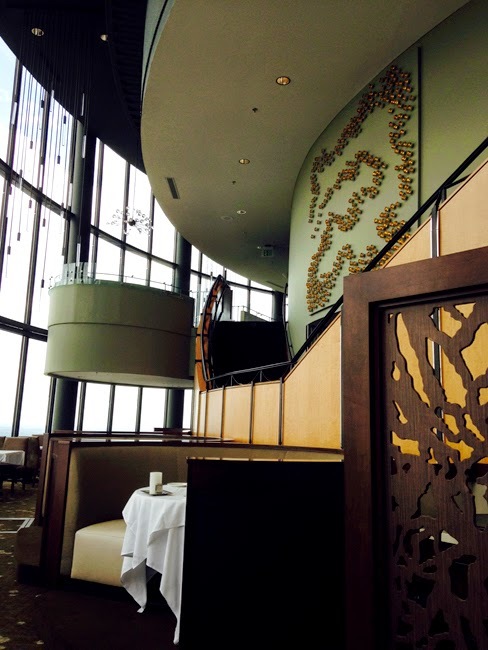 I recently had Sunday brunch at the Sun Dial Restaurant, Bar & View. I'd not been in a while and it'd been forever since I'd had brunch there. One word..."Wow!" I almost wrote, "For a hotel restaurant, the Sun Dial is pretty awesome," but that would not at all be accurate. The appropriate proclamation is, "The Sun Dial is totally awesome!" Not only is it the highest hotel restaurant in the Western Hemisphere, the newly renovated space is stunning, the service was superb, and the food—with a local ingredients focus—is delicious and beautifully presented. The menu changes three times a year. The Sticky Buns appetizer is a slice of heaven! I had the trout and my friend had the smoked salmon...all of it amazing. And the blue cheese-stuffed olives in my martini were perfection. My only regret, no room for dessert. But I left with a promise to return in the not-too-distant future just for dessert, specifically the Hazelnut Carmel Crunch! Major kudos to our server, Jeremy, who was wonderfully attentive and possesses a natural friendliness. He timed everything perfectly, our glasses were always full, and he was gracious in his service...he made us feel like VIPs. I for one am highly grateful. And, just for the record, he nor anyone else on staff knew that I author wanderlust ATLANTA, or that I'd be writing about the experience. 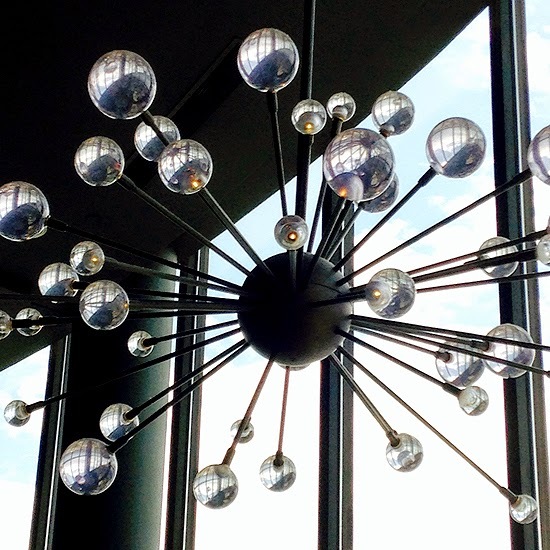 If you've never been to the Sun Dial, you're in for a treat! 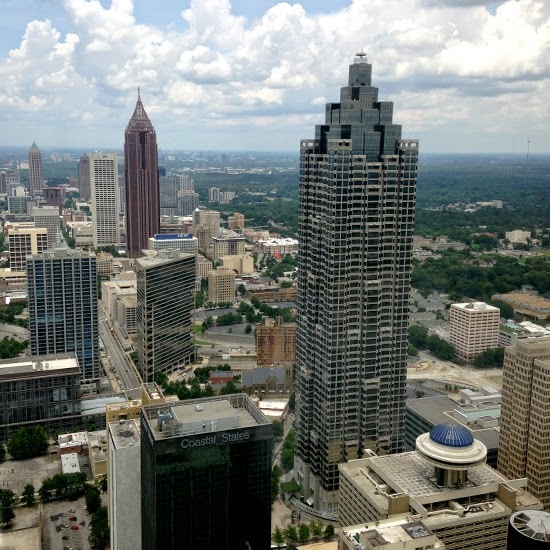 It's on the 72nd floor of the Westin Peachtree Plaza, an Atlanta icon designed by John Portman and built in 1976—the tallest hotel in the world at the time. 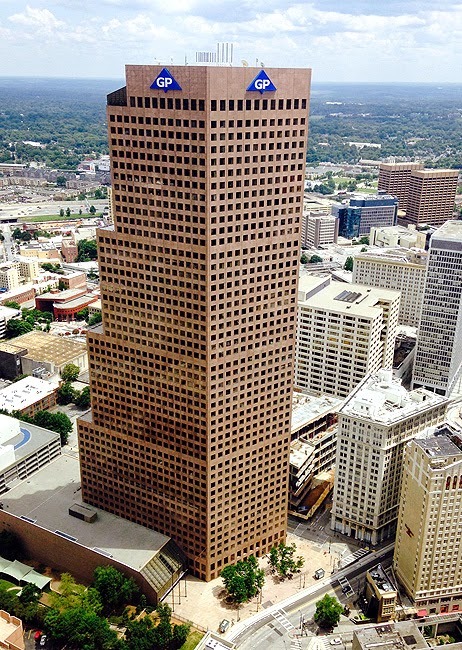 It also was the tallest building in Atlanta until 1987, when the IBM Tower, now One Atlantic Center, opened. By the way, if you've never checked out non-Atlanta Portman projects, I highly recommend you do, especially if you're an architecture enthusiast. I highly recommend making reservations before you go, but I've been known to visit the bar, which also revolves and is situated above the restaurant, without a reservation. 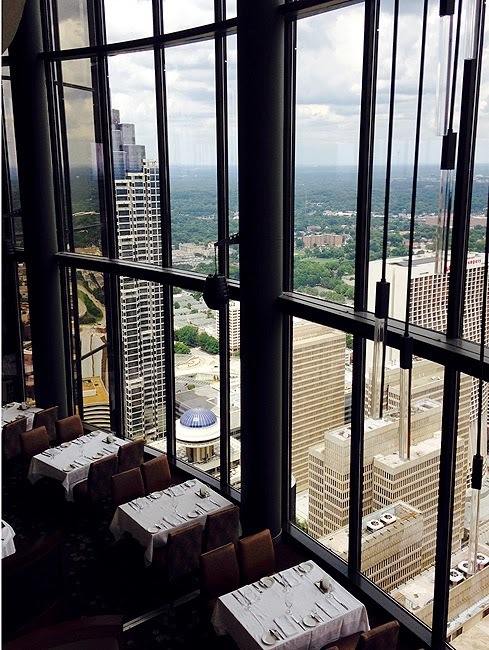 When you arrive, you'll want to enter the glass elevators from the 5th floor to enjoy some spectacular views of Atlanta...and they truly are spectacular! You don't have to go to the restaurant or bar to got to the View, but there's a nominal charge at the 5th floor entrance for that experience. It's well worth it! There's no cost to ride if you have a restaurant reservation. The photo above is the Georgia-Pacific Tower as seen from my seat in the Sun Dial. That building was constructed on the site where the Loew's Grand Theatre once stood, the theatre where Gone With the Wind premiered in 1939—December 15th of this year will be the 75th anniversary of the film! All the seating in the restaurant is prime. The majority of the tablecloth draped tables are next to the floor-to-ceiling windows, offering a one-of-a-kind view of our amazing skyline—and you can see as far as Stone Mountain, Kennesaw Mountain, and well beyond Hartsfield-Jackson International Airport. If you don't get a window-side table or your party is larger than four guests, there are elevated booths that also have amazing views. The restaurant takes a full hour to make a full revolution, but that first hour goes fast—it's true what they say about time flying when you're having a good time. The bar revolves a little faster, making a full turn in only 35 minutes. And there's often live jazz in the evenings...I've heard them play on numerous occasions and they're fantastic! These aren't my best photos—all were made with my phone; didn't have my real camera with me—so check out the Sun Dial's Facebook page and their website for some superior photography. Again, I'd like to offer a "Thank you" to Jeremy for the fantastic service and compliments to Chef Jason Starnes on a remarkable menu! 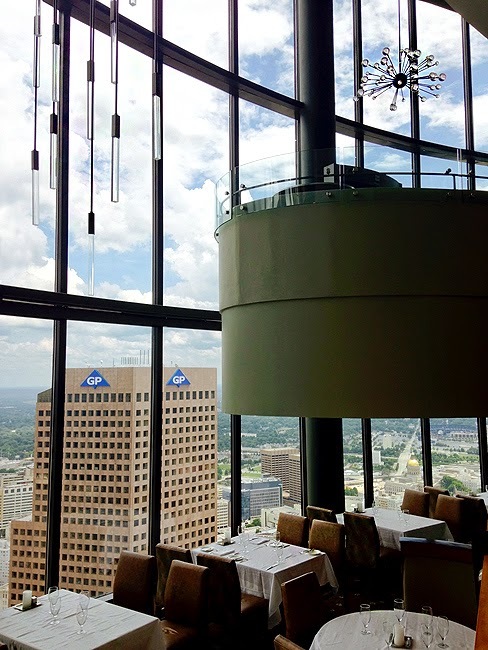 I'll be back to the Sun Dial Restaurant, Bar & View quite soon! Bravo. I love the picture of Georgia Pacific.